YROPRO 2 is a free, automatic Yu-Gi-Oh! online game that gives players the opportunity to duel in single player or against other players using all the released yugioh cards, new cards are constantly being added to make sure the players decks are up to date. YROPRO 2 is the best free Yu-Gi-Oh! online game, its engine is based on the ygopro engine, offering the most features and providing an unmatched experience for its players. We are working diligently on updating and improving all aspects of the game. We release new updates frequently and the game uses our auto updater application which means you never have to worry. 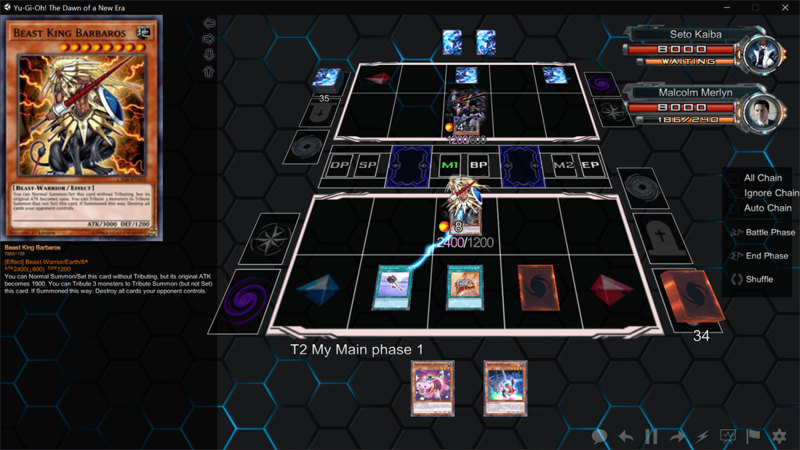 The main appeal of YGOPRO 2 is the new aesthetic, the duels are sleeker and flow better, and the game itself feels more alive with images of the cards popping out from the card. In addition to that even the deck making has the option of searching for cards by pack or release year. Lastly the game can be customized even more than before, this includes changing Backgrounds, sleeves and card images. On top of that YGOPRO 2 is compatible with Yu-Gi-Oh! The Dawn of a New Era (TDOANE). This means that you can duel against anyone who plays TDOANE. If you already have a Kaiba Corporation account your stats will sync between all our games. You can download ygopro 2 from this website. Once the ygopro 2 download is complete, simply run the installer and follow the on-screen prompts. On top of this we always welcome constructive feedback and relish the opportunity to support the Yu-Gi-Oh! community in all its incarnations. Please feel free to contact us with any comments and/or inquiries. We here at Kaiba Corporation have been working on yugioh products for over 10 years, furthermore we are currently developing a real duel disk project. Therefore by playing our games you help support our duel disk project.